“The bombardment was constant,” said Ira Laptyeva. She lived with her family in Debaltsevo, a key strategic town in the Donetsk region in Eastern Ukraine. In January and February 2015, separatist forces fought government troops in a fiercest in battle Ukraine’s civil war. Nearly all the buildings in the city centre were destroyed or heavily damaged. Bodies were found in houses and cellars after the battle. Anyone who could get out, did. Ira is also physically disabled. She has a small, slight frame, the size of an eight year old child. Her toddler son Bohlan is disabled too. Exhausted almost to a sitstill, fearing for her child, she finally managed to get him out of the city. Then she organised for her husband and his father to be evacuated. Now they live in Khakiv, a city in government controlled Eastern Ukraine. They stay in sheltered accommodation with other families who have been forced from their homes. They share one room together, but it’s warm and safe. They receive food and financial help from Caritas. “We’re just trying to stay positive,” she said. Shelter is one of the biggest problems for people fleeing the fighting. In Khakiv, they registered 200,000 people. The actual numbers could be twice that. Across Ukraine, 800,000 people have been registered as internally displaced. They thought the war would be over quickly, so they only packed holiday clothes. Weeks turned into months and their money quickly ran out. They couldn’t afford an apartment for a large family. Eventually they found an unfurnished house in a Slovyansk town in Donetsk that had been taken back by the government. They live in a ‘Modular Village’, a series of prefabricated annexes built with European aid, along with other families who have lost their homes in the war. Their living space is tiny, but Anna and her husband have worked on making it feel homely, building shelves, tables and cupboards. “We try to provide as much comfort as we can so the children can live a normal life,” she said. The two eldest go to school, the husband has been able to find work and Anna stays at home to look after her 8 month old baby (“He was a big surprise”, she said). Caritas aid is focused on providing large families, single mothers and families with disabled members with money for rent, food and medicine. Some of the damage you cannot see. “Zahar was a very special eight year old boy from Luhansk,” said Valentyna Bachynska, a coordinator at a Caritas centre in Kiev that provides a place for children to play and counselling for those affected by the war. The children at the centre suffer from various forms of trauma, expressed through aggression, being closed, grieving and hyperactivity. They might have lost their loved ones, their pets, their friends and they have all lost their homes. “We finally broke through with Zahar after asking him to draw the sun after the rain. It freed him from his anxiety and he was able to explain to the other children that after the rain, there always comes the sun,” said Valentyna Bachynska. Activities are aimed at improving communication and openness: they have art, drawing on the sand and movement. “A child is the mirror of the family. 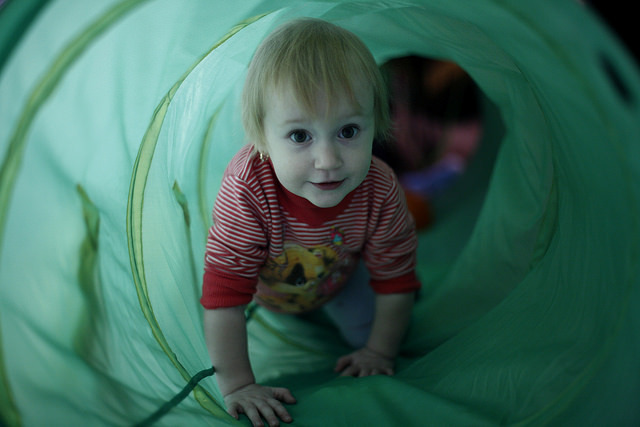 What’s happening at home – the anxiety and stress – is reflected through the child,” said Valentyna Bachynska. So there is a parent-child programme involving “Eight Steps to Good Parenting” group work. 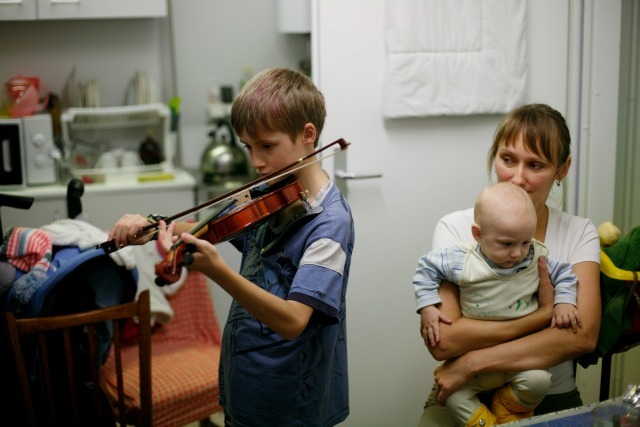 “I just wanted silence,” said Tatyana Ignatova, a young mother from Luhansk now living in Kiev. “I refused to leave the apartment.” She had escaped from the warzone during a temporary ceasefire on one of three trains leaving the city. Her husband doesn’t work. She spends her time at home with the children. They can’t get the youngest into kindergarten because you need a vaccine and the hospitals don’t have any more vaccines. They don’t have enough money for heating and for living expenses. “We’re like war refugees now. It’s so stressful,” she said. Her 5 year old son asks everyday when they are going home and if a tank is parked in his town. “He experienced the shelling. He saw all the military,” she said. The two year old is hyperactive today so has come to a special room with sand drawing to calm down. “The sand drawing allows him to create his own pictures. He likes the feel of the sand. He could spend all day there,” said Tatyana Ignatova. In the corner of the room is an old piano. The keys have been painted all the colours of the rainbow and the piano has been decorated with pictures of weather, children expressing different emotions and park benches in different settings. It’s a way for children to express themselves. Volodya, a 13 year old boy from Donetsk, sits at piano. He picks the highest note on the keyboard. It’s white. “I’d like to dream listening to this sound,” he said, “Of home and of hanging out with my friends.” With no end in sight for the military conflict, the chance of going home for any of those who fled the war remains a dream for now.